You may have noticed a new ‘Weleda‘ page on my blog? If you haven’t or are now wondering ‘‘What’s Weleda?’‘ then let me explain. Weleda is a world leading manufacturer of holisitic natural skincare, cosmetics and naturopathic medicines. That sounds like quite a mouthful doesn’t it! Simply put, Weleda make health and wellbeing products that are good for you. Weleda use only plant based ingredients chosen for their healing properties and zero chemical nasties while being kind to the planet. 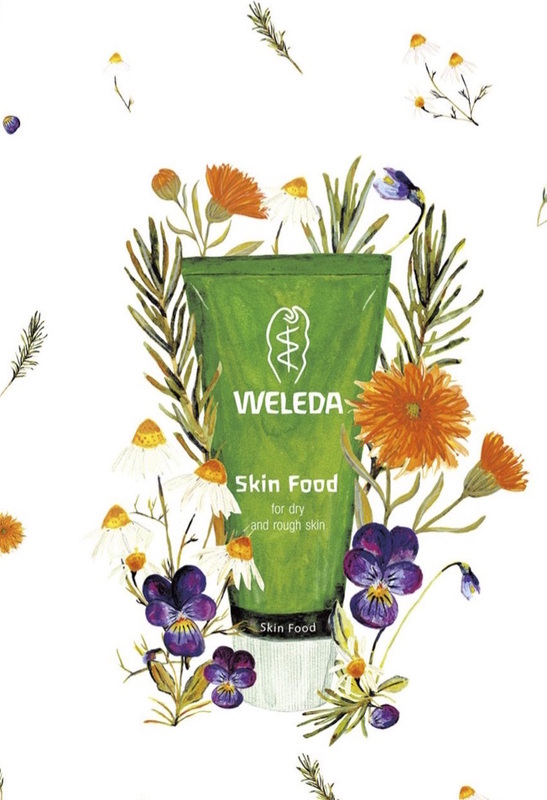 All Weleda ingredients are grown bio-dynamically, with impact on the environment considered at every stage of production. 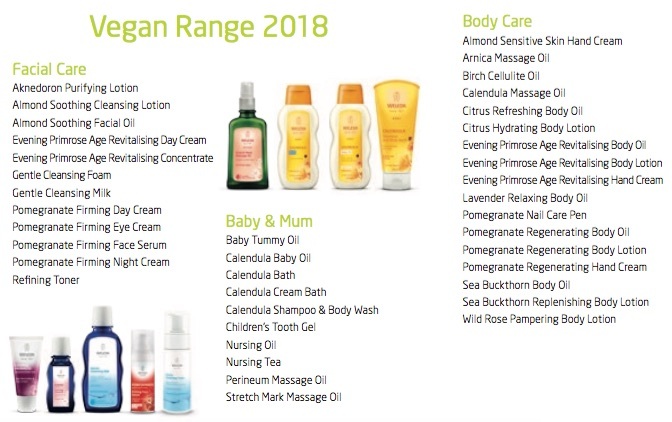 I was browsing the Weleda website with a view to buying some new skin care products (after writing a blog post about clearing out my bathroom cupboard) when I noticed a ‘‘Join our Family” invitation. Fast forward a month or two and I’m now a Weleda Wellbeing Advisor in Gloucester. Here are 5 reasons I decided to join the Weleda family and become a wellbeing advisor. ♥ Weleda’s philosophy of ‘People. Planet. Profit’ remains unchanged in nearly 100 years. Weleda was established in 1921 by Rudolf Steiner and the company continues to follow the principles he set out: to create a company ”in harmony with nature and the human being, to use the best quality organic ingredients grown using biodynamic methods and help people to heal themselves.” I love that my favourite Weleda product, Skin Food, was one of the first to be created and is now over 90 years old (and being made using the same recipe developed by philosopher and scientist Steiner, Dutch Dr Ita Wegman and German Pharmacist Oskar Schmiedel). Isn’t that amazing when a brand gets something so right from the start that nothing needs to be changed even with so called advances in technology and understanding! ♥ Weleda make products with 100% natural ingredients. Over 1,000 natural ingredients go into Weleda products each year and all ingredients are sourced in ways that are sustainable, ethical and kind to the environment. Read more about Weleda’s sustainable business approach . It may not seem that unusual to find beauty products labelled ”natural” these days but all is not as it seems in the world of natural beauty. It’s easy to be fooled by ”natural” claims and not realise many ingredients are still synthetic or potentially toxic. There’s even a term for this, ”green washing”, when companies falsely claim they’ve made environmentally friendly choices as part of a marketing strategy to make consumers think they’re making good choices by choosing their product. 60% of what we put onto our skin goes into our skin so it’s important we know what is in the products we choose. I feel particularly strongly about this since my Mum died. I only get one chance at looking after my body and I’m worth the extra money it costs to buy quality life enhancing ingredients. ♥ Weleda products are all certified natural by NATRUE personal care. ♥ Weleda is a unique organisation – economically thriving, kind at heart and committed to the well-being of our planet, our environment and our people. 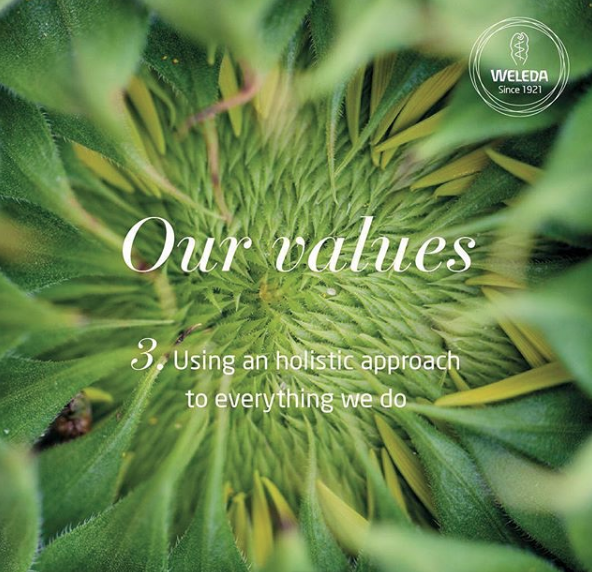 Read more about Weleda’s values. 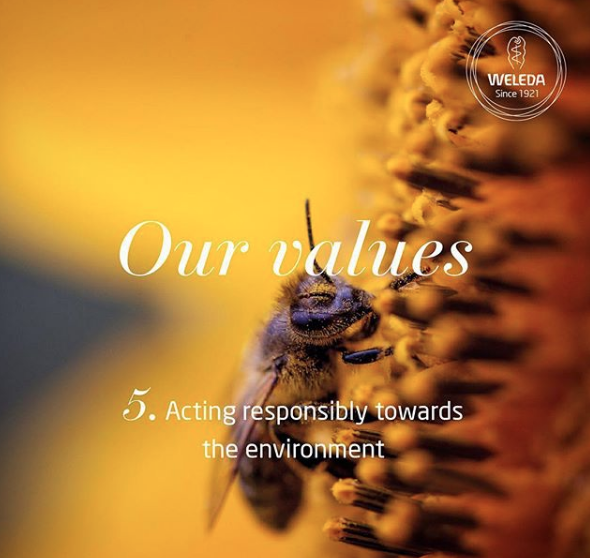 Sustainability is central to the Weleda brand. 85% of the glass used in Weleda’s bottles comes from recycled glass – the highest share of recycled glass possible. Product cartons are printed using mineral oil-free inks. Weleda’s soft plastic tubes are made using recycled plastics and can be further reused when empty as part of the Terracycle Uk recycling scheme. 97% of the company’s electricity used during manufacturing comes from renewable energy. 98% of all waste produced during the manufacture process is reused – either composted, repurposed, recycled or recovered. Today, Weleda is represented in over 50 countries on all five continents. The three main sites are still where Weleda’s history began: in Arlesheim, near Basel in Switzerland; in Schwäbisch Gmünd near Stuttgart in Germany and in the French city of Huningue, Alsace. 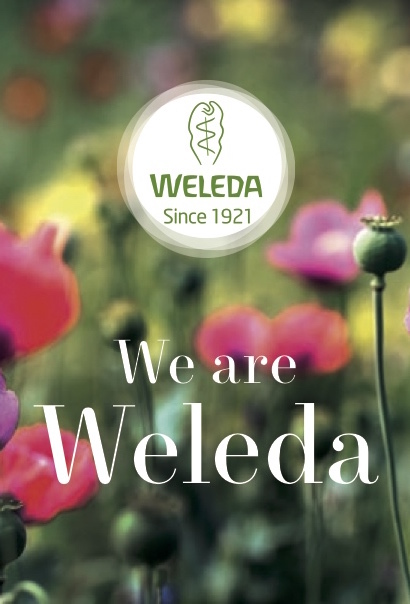 From these bases Weleda produces hundreds of natural cosmetics and thousands of pharmaceuticals, still partly produced from medicinal plants from Weleda’s own gardens. Weleda manages approximately 248 sq km of organic growing spaces worldwide – the equivalent of 35,000 football pitches. All these facts and figures about Weleda (which you can read more about in the Weleda brochure) astound me, especially when I read opposite stories of large supermarkets struggling to reduce their environmental impact. If you live in Gloucester and would like to try Weleda products for yourself please get in touch (nic.moorey@weleda-advisor.co.uk). I can offer a free skin care consultation where you’ll try cleansers and face creams specifically matched to what your skin needs. You can try body oils and lotions while relaxing with a soothing foot soak. Weleda also have a fabulous range of baby products which make wonderful gifts for new Mums. Please get in touch If you’d like to host your own wellbeing event for family or friends. Details of this month’s offers are below. I look forward to hearing from you.